An effective “CAPA” or “Corrective and Preventive Action” process is an essential component in any modern Quality Management System. In every process; errors, deviations and failures can arise. However, it is critical that if and when deviations to expected norms of performance are identified, that they are effectively and permanently addressed. The CAPA process will drive comprehensive root cause analysis. Will ensure an appropriate solution is implemented. Will provide confirmation that the deviation will not repeat. Will establish records of all stages of the investigation. Such records may be necessary to provide evidence to regulatory bodies of compliance with regulatory requirements. 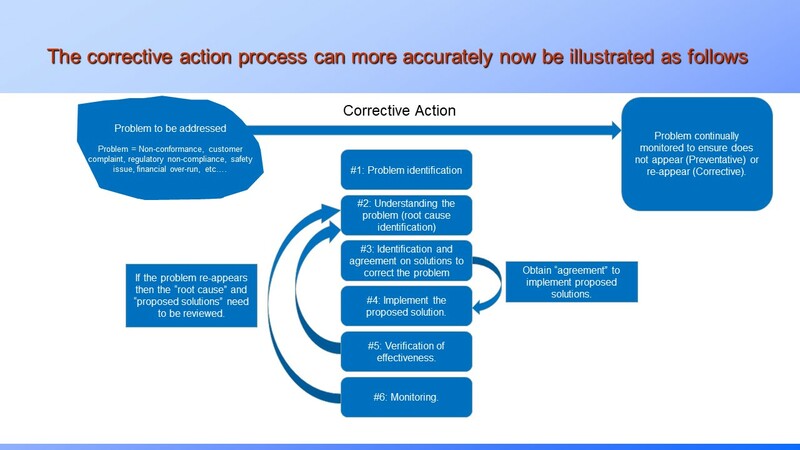 What are the key steps in an effective CAPA, Corrective and Preventive Action process? Quality Management Systems. Corrective Action. Documentation. Risk evaluation. Customer complaints. Etc. … Information and training presentation. Details. i) Clearly define the problem. Unless the problem is understood, ideally with a measure of some sort, it will be impossible to know if and when the problem has been addressed. At this stage, you may want to consider some form of risk assessment. Does the process or product failure pose a potential risk to the organization or any of its stakeholders (customers are included here)? If yes, what is the level of the risk and what if any mitigating actions can be taken in the interim, prior to addressing the non-conformity. Gather up data, failure rates, complaints, internal and external audit reports, talk to those involved or with knowledge, etc. Here you might apply some problem investigation tools such as 5 why’s analysis, HAZOP, PFMEA, …etc. to help drive down to the root cause. iii) Identification of the root cause. If you use a cause and effect process to help investigate the problem, what is the key cause, or are there multiply interactions causing the non-conformity to arise? This is critical. However, you will only really know if you have identified and addressed the root cause(s) when you implement, measure and monitor the solution. iv) Once you have identified the root cause(s), you will want to propose a solution. As part of this process, you will need to revisit the risk assessment. What are the risks posed by the new process or new product modification? Are there new risks being introduced? Will the overall risk to the organization and its stakeholders change? Will the proposed new process require changes to documentation, training, equipment, etc., if yes, how and when will such changes be implemented? v) A plan to implement the new change needs to be defined. The plan will identify all potential impacts, e.g. are there any regulatory submission impacts, clinical data impacts, customer training, DFU (direction for use) revisions required? Maybe, current product will need to be obsoleted. Will raw material suppliers need to be contacted with revised raw material specifications? Will validations need to be repeated, etc.? Once the solution has been implemented, the process or product will need to be monitored to ensure that the original problem has been addressed. If yes, great. If not then you may need to go back to investigating the problem and identifying the root cause. This is effectively performance of the Plan-Do-Check-Act cycle. A step often overlooked is what can be learned from the original failure and the subsequent CAPA investigation that can be applied to minimizing potential failings in other areas of the organization, or with other products or processes. This is an important step, but can lead to significant and critically positive changes being identified and implemented. Finally, on say an annual basis, the operation and learning’s from the CAPA process will feed into the management review, where overall trends in process failings, investigation findings, solution implementations, etc., can be monitored to ensure that the CAPA process remains an effective and critical component to driving a continually improving Quality Management System within the organization.